Summary: This is a wonderful walk. 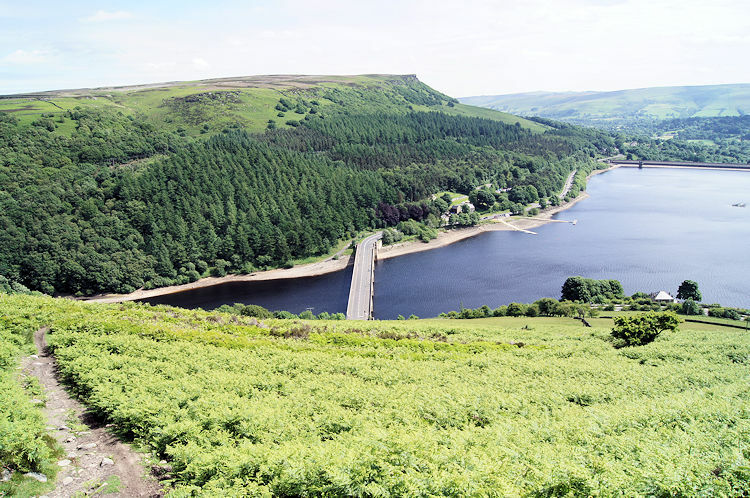 The first half, outgoing from Cut Throat Bridge west to Ashopton on the edge of Ladybower Reservoir and then from south to north alongside the east shore is on undulating ground which is at just over the 200 metre height level. Much of this first half is enjoyed by walking through succulent woodland. The second half of the walk begins once the reservoir banks are left with a steep ascent to Derwent Moor by Lanehead and Briery Side. After the the climb views across open moorland are to be enjoyed, only blocked out to the east by the rising flank of Derwent Edge. And that is where to go, back along the edge from north to south while enjoying all the outcrops. Afterwards enjoy a short moorland finale. The Walk: I looked for something to do while my wife went shopping with her daughter in Sheffield. We were staying the evening so a good walk would be ideal as preparation for a good night out; I always feel better when out having fun after a good walk. The event decided, the remaining question was where to walk? 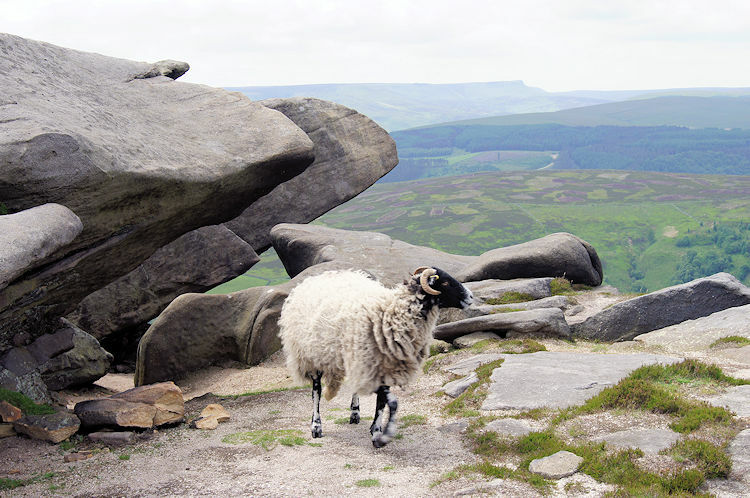 I was not familiar with the countryside surrounding Sheffield but I did know west was best and with that in mind I soon focused on the area near Ladybower Reservoir. Derwent Edge stood out almost immediately so I planned my walk to include a linear walk along the edge. Thus I spawned the circular walk I shall now follow which starts from the not in the least romantically named Cut Throat Bridge. It was a lovely day, a warm and sunny day on the last Saturday of June 2013. 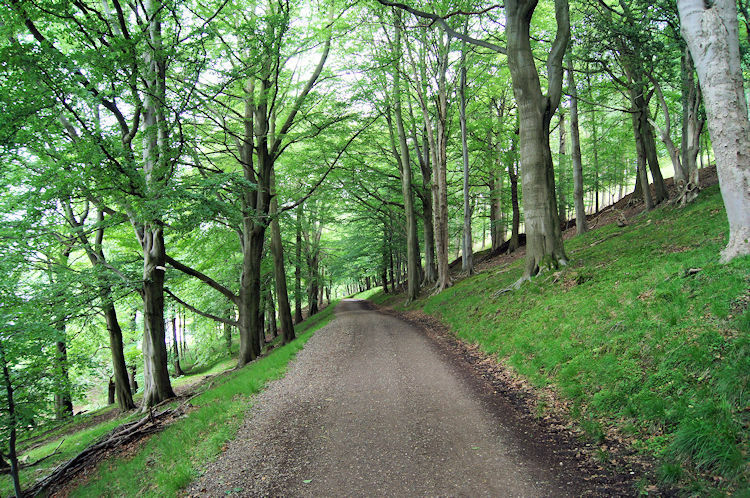 After setting off early from Harrogate and then dropping Lil off with Jocelyn at the house in Wakeley which is a lovely hilly suburb of Sheffield I left the city by following the Rivelin Valley Road to the fringe of the Peak District National Park. A few miles of quiet country road later I reached the lay-by car park just east of Cut Throat Bridge. It was around 10am and already there were a dozen or so cars parked, most empty, a couple emptying with walkers donning their boots and filling their rucksacks. I followed suit. They went their way from Cut Throat Bridge across the moor, I went mine down towards Ladybower Wood. The woodland was lush and a vivid green with early morning glints of sun enhancing the enchanting views. From the woodland I emerged to follow a track above Ladybower House which provided my first view of Ladybower Reservoir. From my crest above Ladybower I descended to the level of the reservoir at the small hamlet of Ashopton. The place was quite as could be, nobody stirring at all. The only noise was that of birds singing their springtime bird song; we are blessed with such wonder of nature. 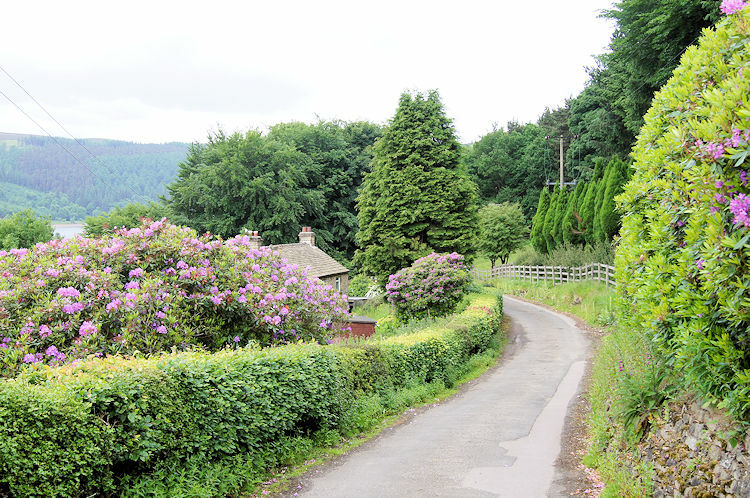 I listened attentively while soaking in thew vivid colours of Rhododendron spread about the village. From Ashopton I continued on a level just above the reservoir waterline by following a wide track into mature woodland. As I walked along the track some runners passed me on their morning training routines - not such haste for me though, I like to walk and soak in my surroundings rather than rush past them. After sometime walking along the track I came to the site of the lost village of Derwent, one of many swallowed up in the last 100 years by the march of the reservoirs. Derwent was abandoned in 1944 and the village demolished as the dam took effect and water levels rose. 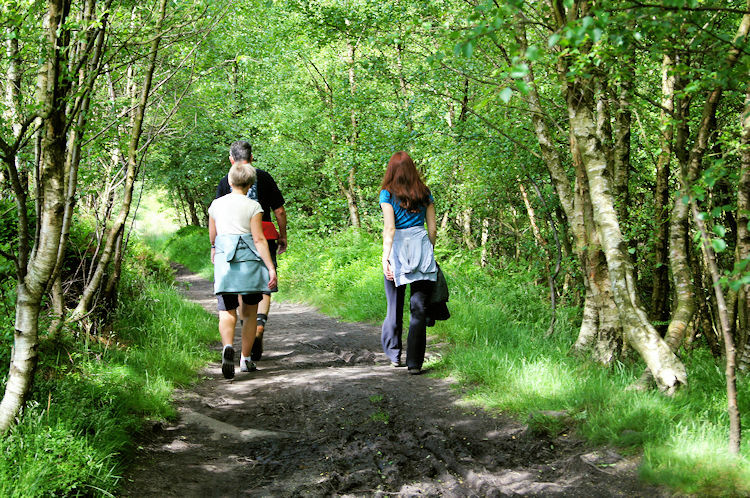 At the lost village of Derwent I came across a group of about 25 walkers, most of a mature age. They were setting off as I arrived by after leaving the site of the abandoned village and leaving the track to ascend on a path to Briery Side I came across them again. 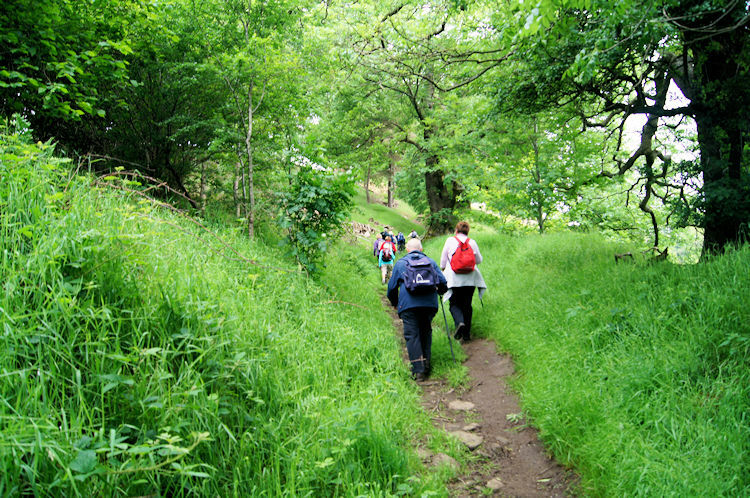 After catching the stragglers I talked to a lovely elderly gentleman who told me they were the Huddersfield Ramblers. We continued chatting away as we ambled up the bank together, he apologising for interrupting my solitude while thanked him for his polite conversation. The gentleman told me he was in his eighties and that he will continue walking until his legs will carry him no more. I told him I vowed to too. Then as we reached the moorland and the track levelled out I stopped to let him continue on and catch his colleagues. "I know where they are going and I like to wander by myself anyway" he said. "Much like I sometimes" I replied. And then we parted to continue our enjoyment of the day. Walking on to the moor and beside the summit of Pike Low I dipped into a shake hole and sat down for a drink and a bite to eat. As I relaxed a pair of Curlew flew overhead in springtime courtship. When they were gone and quite fell on the moor again I emerged from my hole. Looking ahead I could see the Huddersfield Ramblers about a quarter mile ahead, they were not taking haste. And true to his word the gentleman I spoke with was detached from the group, beating a parallel path about 100 yards away from them. 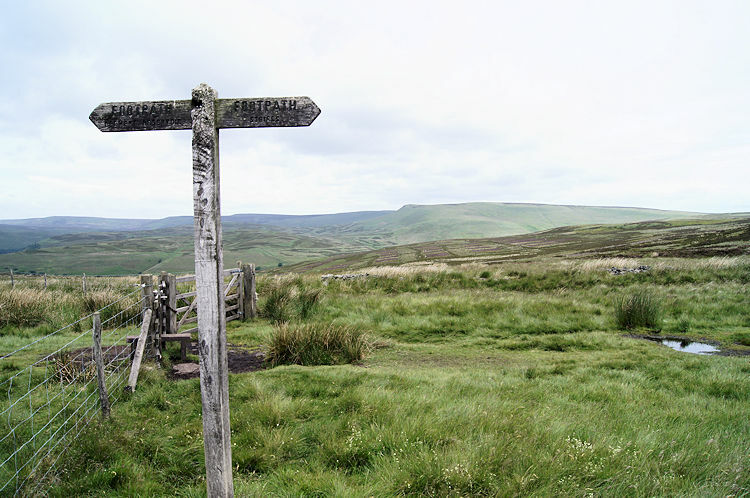 I walked towards them on a true north course before veering north east and then east towards Lost Lad which I had seen during my moorland crossing as being the starting point of Derwent Edge on its northern limit. 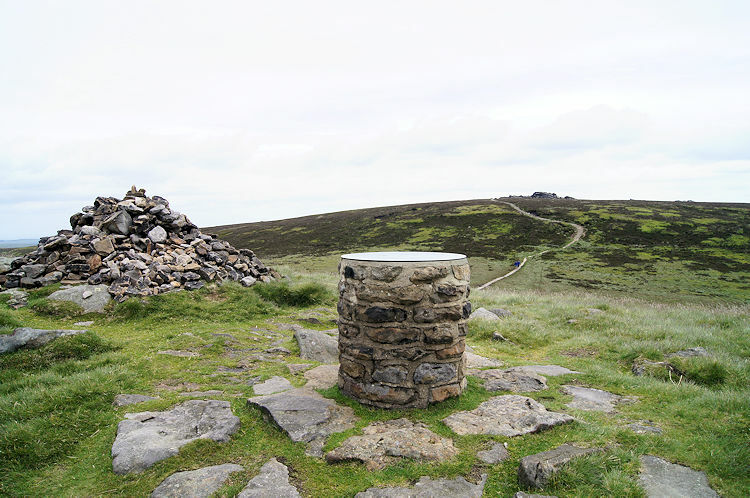 A gentle incline led to the summit and the true beginning of my walk across Derwent Edge. Before I began the climb I passed the Huddersfield Ramblers one more time. They were all sat just short of the climb, fueling up over lunch. The climb to Lost Lad was straightforward, a short haul up a stepped stone path. At Lost Lad I came to a cairn and beside it an information pillar which pointed out hills and points of interest seen on a clear day from the panorama available. I took a look and observed the whole scene as much as I could, making out some of the places indicated and not quite working out others. 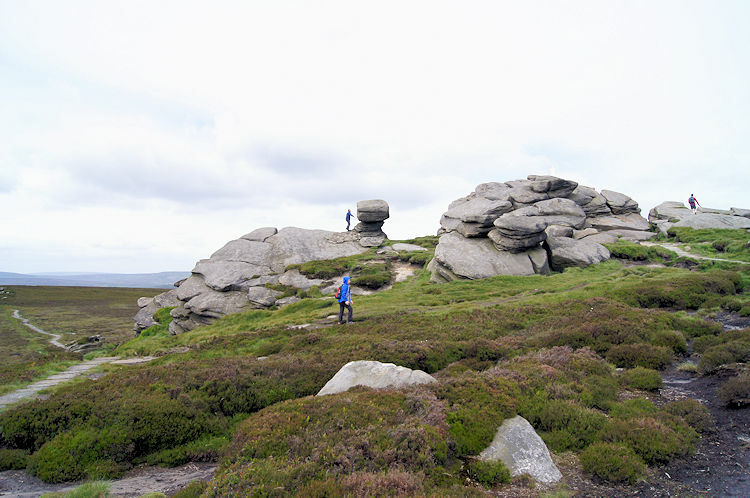 Then I walked on and made my way to Back Tor, the only named point on Derwent Edge with a trig point. On reaching the trig point I was at the heady height on 538 metres. More so, all the significant climbing of the day was done and bar a few undulations it would be downhill all the way. The fact the climbing was done was forgotten on Back Tor though for the granite outcrops took precedence of thought. My attention was completely focused on the incredible shapes formed by weathering over the ages, an erosion which created all kinds of interesting formations. In some places large rocks stood at height sat on smaller stands. Some were precariously balanced and no doubt the scene is constantly changing, particularly after storms. Without notice, as my attention had been taken by the shapes, people began to emerge from what seemed nowhere. People were inspecting the rock outcrops almost everywhere I turned. Clearly I was not the only one smitten by the shapes. 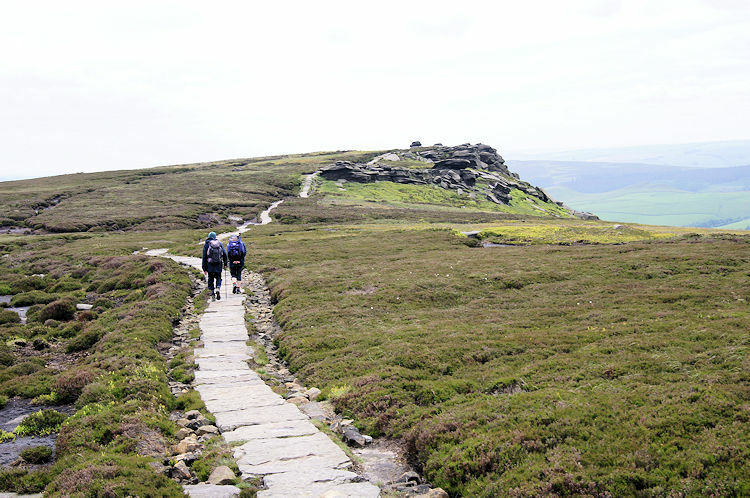 After Back Tor I walked on a good well made and well managed path to Dovestone Tor. Once more people inspected the unique shapes created by weathering of the granite. 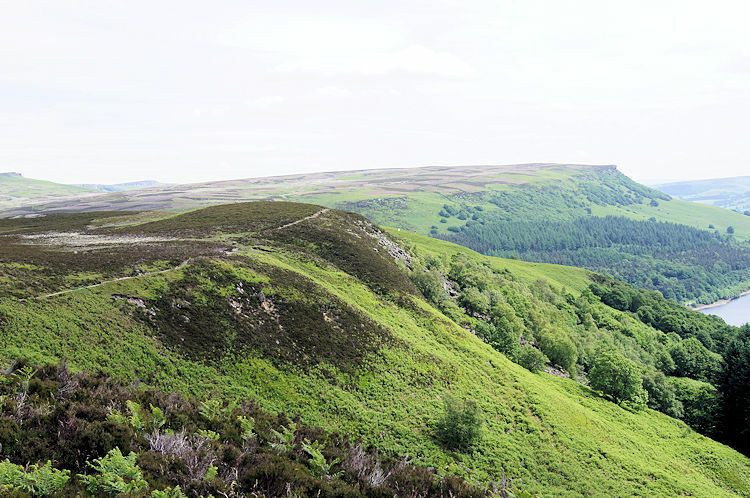 Notwithstanding the outcrops such as Back Tor and Dovestone Tor the walks between the highlighted features was also fascinating. The views were superb and so different whichever way you looked. To the east the vast track of moorland seemed bleak and ominous but closer inspection revealed more rock outcrops and lesser edges in the distance. 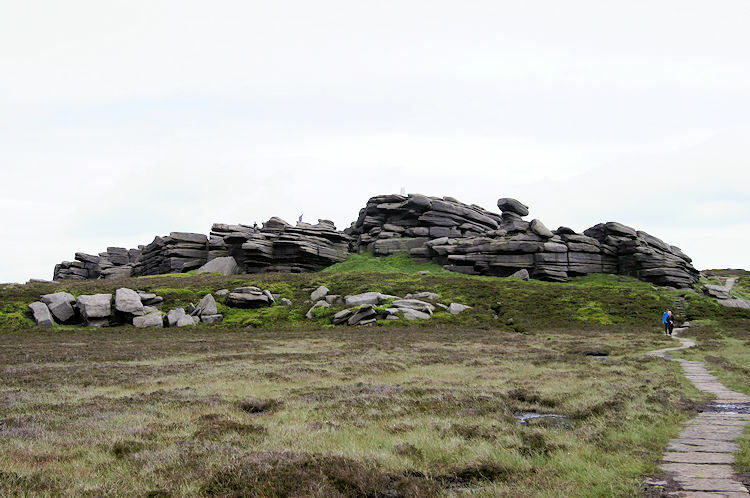 One such outcrops was a series of granite pillars called Cakes of Bread and I worked out a distant raised cliff as being Strines Moor Ridge and Strines Edge. 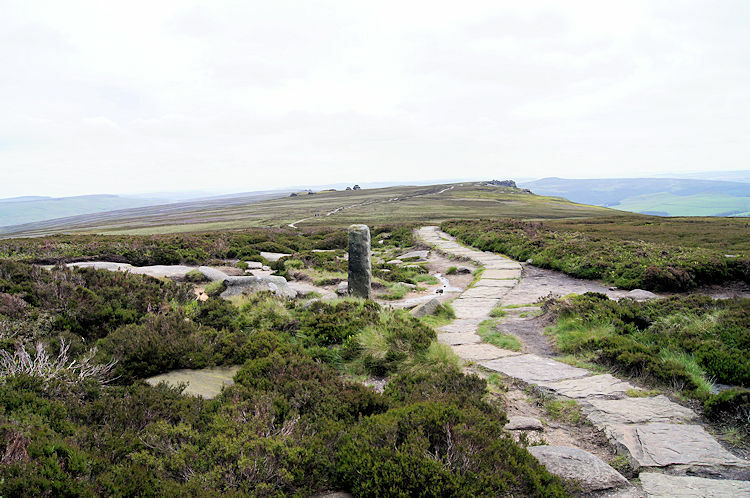 I was tempted to detour to it but this time I stuck to my planned walk on Derwent Edge. The view to the west was vast, more on that in the next paragraph. For now I headed to White Tor. White Tor was the next in a series of outcrops scattered along Derwent Edge. 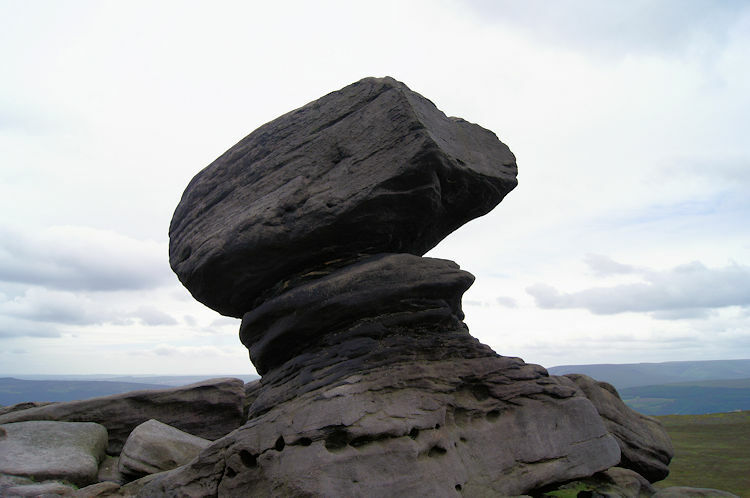 As I walked to White Tor from Dovestone Tor I passed the Salt Cellar boulder, another remarkable shape forged over time and one worthy of its own individual appellation. On reaching White Tor I took my final short break on the walk, finding a cosy niche on the west facing exposed side of Derwent Edge. 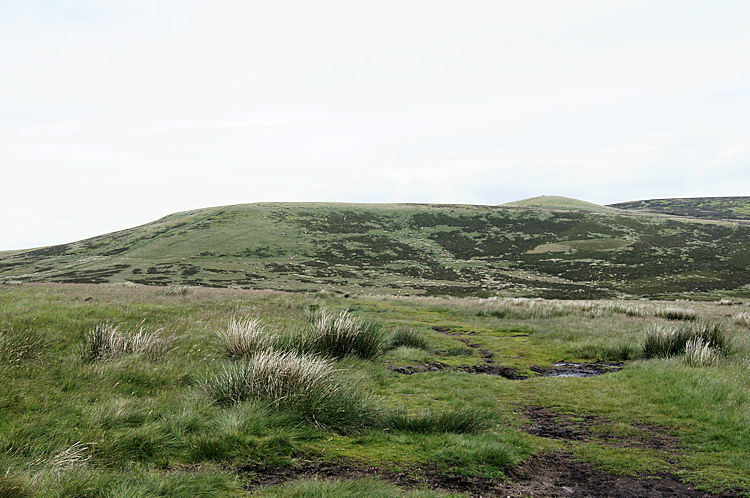 The views east, as mentioned in the previous paragraph were across moorland. This break time view, looking west could not have been more of a contrast. 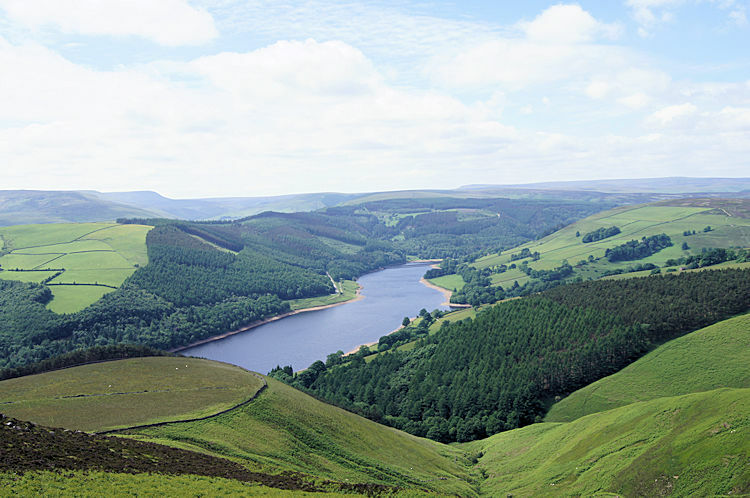 Immediately west I looked down into a lush valley with Ladybower and Derwent Reservoirs filling the valley bottom. Beyond the reservoirs I could make out many of the popular Peak District hills including all on the famous ridge of Mam Tor, Hollins Cross and Lose Hill. Then there was the Kinder range of Edale. What views I looked to as I ate lunch at my precious vantage point. And what memories they evoked, of brilliant walks done. 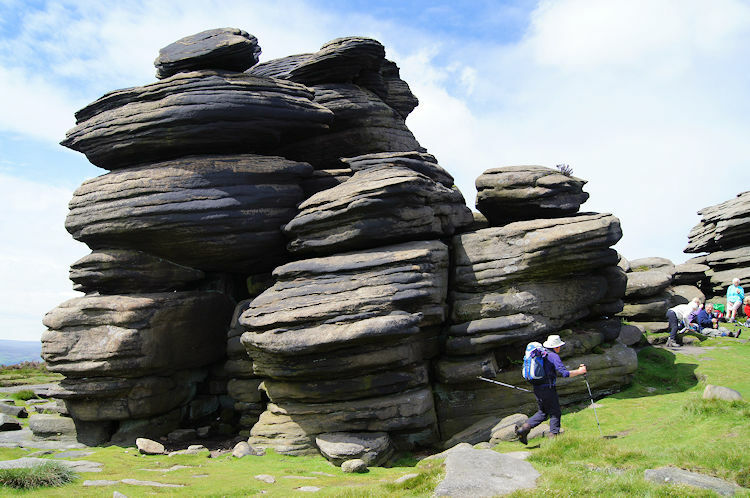 After my lunch I scaled round the edge of White Tor and followed the brilliant path to Wheel Stones and then on to Whinstone Lee Tor. Each of these final two outcrops on Derwent Edge excited me as much as those previously explored, both being equally fine examples of weathered granite. On this website I often wax lyrically about the sumptuous weathering of limestone, the white rock jewel of British uplands but granite is its darker cousin, as much to be admired and a longer lasting rock than the vulnerable limestone which dissolves at a much quicker pace. Enjoy both equally as I do, they are admirable accompaniments to our walks in the British landscape. 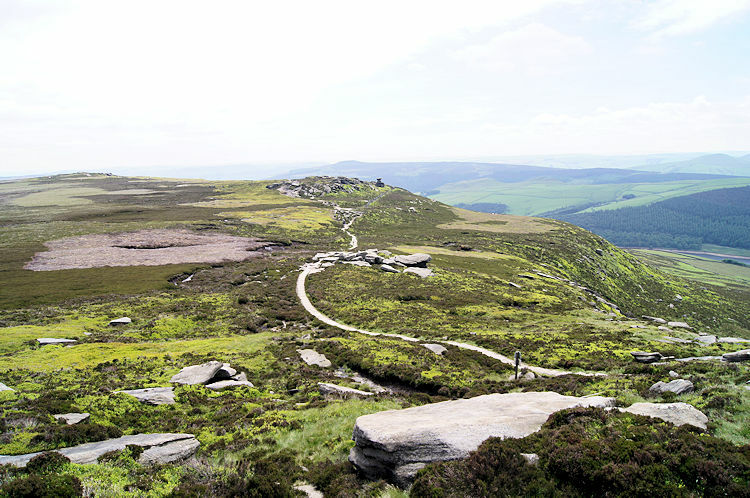 And Derwent Edge exists as a result of such weathering by the tough resistant granite holding the moorland back from falling into the Derwent valley below. From Whinstone Lee Tor I left Derwent Edge but not before spending a final few moments admiring the views from nearby Lead Hill. 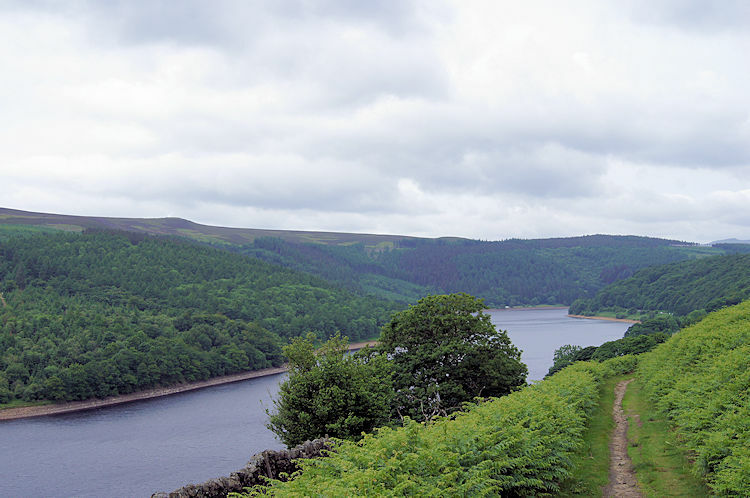 I glanced along the south extremity of Derwent Edge and then down to Ladybower Reservoir with traffic thundering across the A6013 towards the south dam. 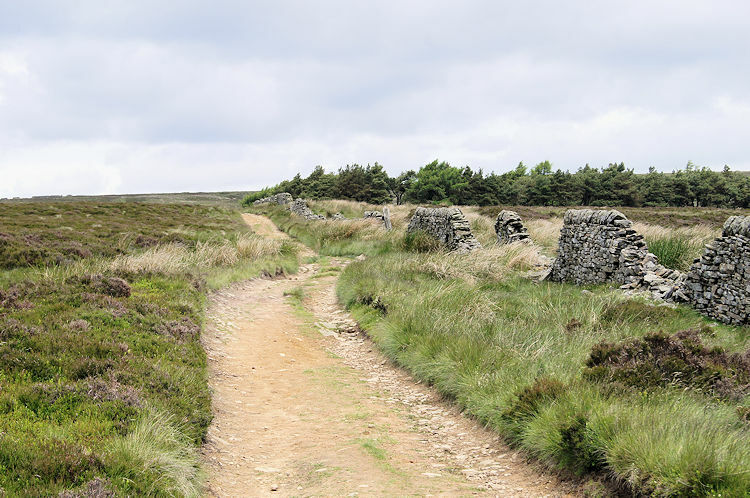 I took the short hike east across the moor to Highshaw Clough and then retraced my steps to Cut Throat Bridge and then carefully crossed the A57 to follow a track to the car park. It was hot in the mid afternoon when I reached the car. I opened the doors and the baking car interior cooled as I sat and relaxed taking in the enjoyment of a lovely walk done. Derwent Edge impressed itself on me markedly it imprinted a special place in my memory. And I know it shall not diminish, the uniqueness of its parts making an unforgettable whole.